This weeks episode of The Walking Dead not only served to move the survivors ever closer to each other, but also gave hope of so much more: a cure. One thing that sets The Walking Dead apart from other zombie-based stories is that there is no talk of what caused the epidemic.That all might change with the revelation that Eugene of the militia group is apparently a scientist who’s discovered the cause. Beyond the possible cure, this episode kept the dynamic of detailing two different groups survival efforts. By having these close up focus-oriented episodes, we get to learn a lot more about the characters backstories than we would have by any other means. Everyone is fragile and broken after the Prison’s destruction. It is only natural for them to open up to each other – and the viewers – about their insecurities, pasts, and motivations. 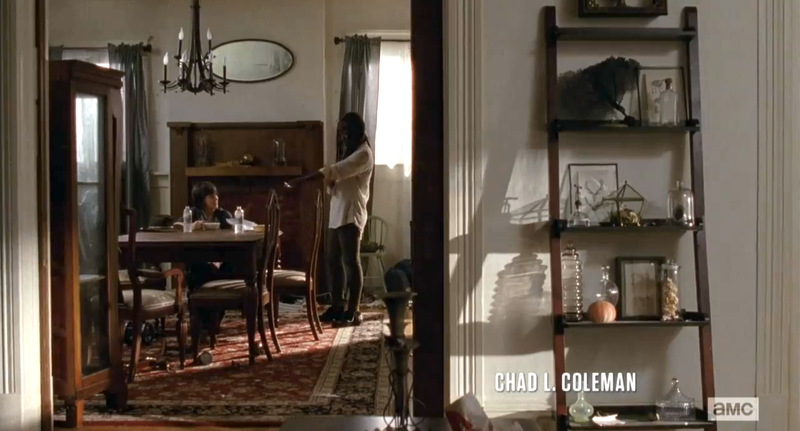 As the episode begins we find Michonne and Carl in a very ‘homey’ setting. Sitting at the table and pouring cereal, the two have a definite friendly banter about them, but also a almost mother/son vibe. As the episode progresses we see how Michonne not only tries to cheer Carl up, but also how she starts to open up about her past. As we saw in “After”, she has chosen life and is now dealing with all the things she’s held inside for so long. By living together in this down period, Michonne is opening up and is sharing things that she never even shared with Andrea. This house has in a way become their new home safe zone. They go on runs to clear other houses and always return to the safety of home. Sadly – as with all safe zones in this series – there is an inevitable downfall. Still weak and recovering from his injuries, Rick goes to get some rest while Michonne and Carl search the nearby houses for anything useful. 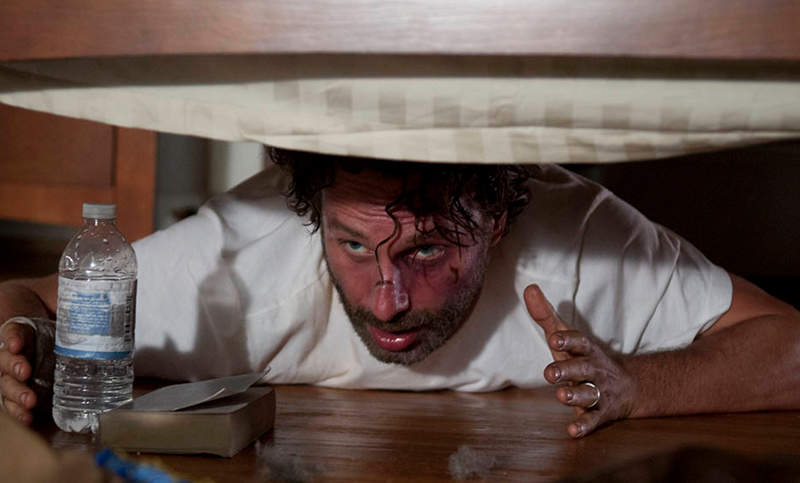 Not long after they leave, Rick is awoken by a group of men who have broken into the house. This immediately reminded me of the very first episode of The Walking Dead, where we have Rick waking up to find himself in a very unsafe environment. As Andrew Lincoln pointed out in Talking Dead, Rick is in grave danger and he knows it. It has been over a year and a half since ‘the end of the world’, and the only people who aren’t set up in some kind of civilization are pillagers, thieves, and other very nasty people. There are no walkers in these scenes and yet they are some of the most nerve-racking threats of the series. Season 3’s tagline was “Fight the dead, fear the living”; and scenes like this are prime examples of that mindset. Rick only has seconds to react when a group of bandits breaks in. The first time we felt this was in Season 2 when Rick was trying to convince Herschel to come back home from the bar and those two men came into the bar. You just got a bad feeling from the get-go, but then got a worse feeling when one started peeing in the corner. They were basically animals. The same happens here. You get an initial bad feeling when they enter, but when you see one strangle the other just so he can have the larger bed you know these are incredibly bad men who aren’t afraid to hurt their own. Did you notice the scene where Rick came face to face with that man in the restroom and killed him? Afterwards, Rick knows he has to leave immediately because the corpse is going to turn in several minutes, but then he remembers something: the corpse is going to turn in a few minutes. Before Rick escapes through the window, he cracks the door slightly so that when the corpse reanimates as a Walker, it’ll at the very least cause a diversion – which is exactly what happens. When Rick sees Michonne and Carl coming back towards the house, he is about to take a stand and kill one of the guys before Michonne and Carl walk into a trap. Luckily, the walker Rick left upstairs just turned and got one of the pillagers, which called everyones attention inside. 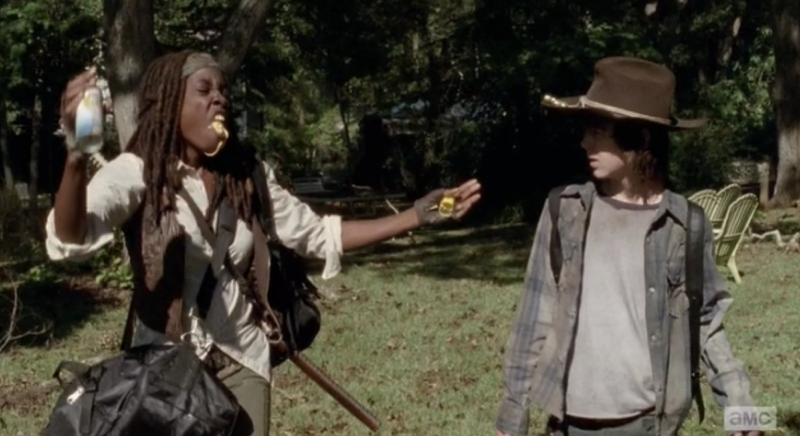 This allowed Rick, Michonne and Carl to head away safely. Whether this band of pillagers has a larger role/will be seen again – doubtful. There are more important things going on. While clearing a house of anything that can be useful, Michonne discovers that their latest hunt is taking them into a very messed up path. 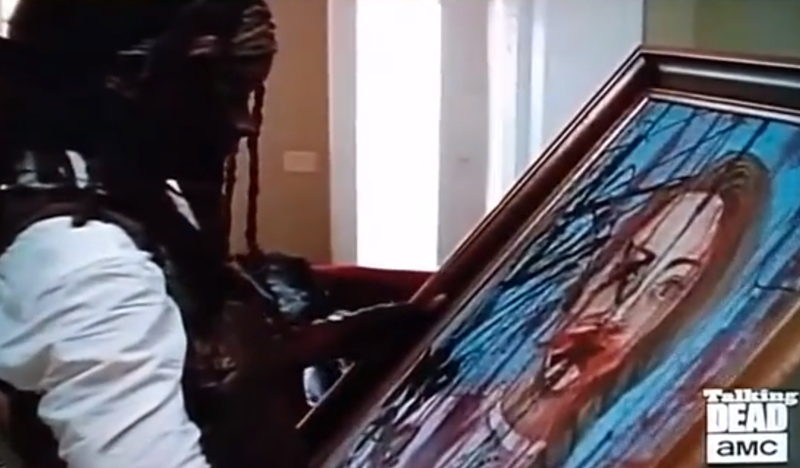 After unwrapping a painting, Michonne sees that it is all marked up – whether it was spelling a warning or just crazed scribbles is hard to say. Michonne then explores the house ahead of Carl knowing that something foul is in that house. She eventually stumbles upon a pink room where the bodies of several children are found on their beds. From their extensive state of decay – and none walker status – you can see that this whole family took their life. Or did they? Its possible that this family gave up hope along the way and committed suicide because they didn’t want to live in this world anymore. The other option is that one took it upon themselves to kill their children and lay them down side by side on their beds as if sleeping. Each possibility more horrifying than the next. Thinking about the fear that must have went through their heads is enough to chill anyone to the bone. Considering all that Carl has been through and losing Judith – so he thinks – , Michonne decides to hide this from Carl and move along. The first of this new group we get to see is the mustachio wonder himself, Abraham Lincoln. He’s adapted well to this new world thanks to his military background, but don’t think of him as a trigger happy Shane type. He honestly seems to be a force of good. He has a ridiculous sense of purpose and is one a mission to save the world. Abraham understands that in this new world you need to bunker down with a group of like minded people who can take care of each other and contribute to the fight. Once everyone gets back together, I would be very happy with seeing him as the new leader – or co-lead with Rick. Rosita on the other hand doesn’t say much, but she seems kind hearted – and really attractive. Judging from how she was the first to go along with Glenn and Tara, I think she is one of the good ones and has a lot to offer the group of survivors. Its the third member of this group that worries me. Whereas Abraham and Rosita claim that Eugene is a scientist who offers the hope of a cure, I feel like there is something more afoot – or rather less. Over a year and a half into the end of the world and he doesn’t know how to handle a gun. He doesn’t get involved when everyone else is fighting. He puts himself above everyone else in matter of importance. Whether he can do what he says he can do or not, he seems to be doing all of this for protection. During the scuffle between Glenn and Abraham, one character is noticeably absent – and emotionless. The last Doctor we saw was Dr Jenner and he was more accustomed to this life than Eugene seems. Perhaps its the mullet, but I wouldn’t be surprised if he made the whole “I know what started the epidemic” up just so he could trick these two into protecting him. I blatantly said to Abraham “I’m smarter than you”, and that intelligence could be exactly what he’s banking on as his bluffing tool right now. Sadly, if they do get all the way to DC and find that he lied, that would be awful – and could spell some important character deaths. Judging from the preview of next week’s episode, the survivors are still trying to find their way back to each other. It also seems like Beth’s diary narration will continue as well. As for who the other group in this episode will be: maybe Maggie’s, maybe Tyreese’s, or maybe both. With Rick, Michonne, and Carl now on their way to Terminus as well, the reunion is coming soon. 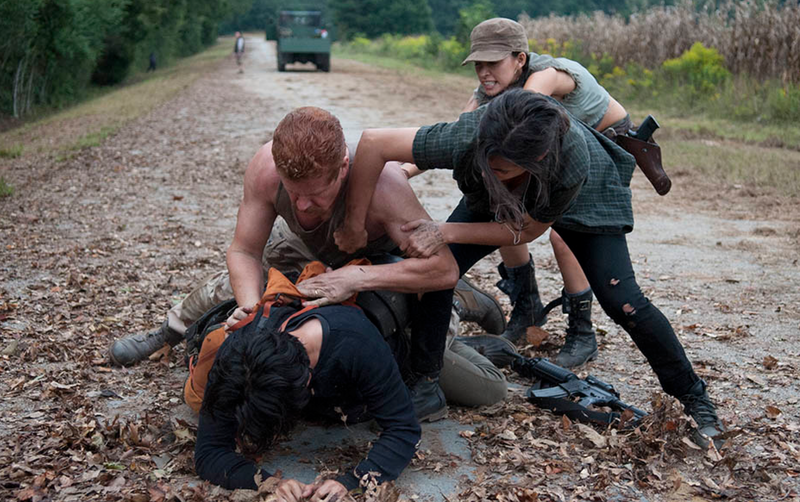 Although with Glenn’s group on their way to DC – and now walking back – it’s unsure when he and Maggie will ever get back together – if ever if Abraham’s words ring true.